Alli G. asks: Why do people today always start sentences with so? 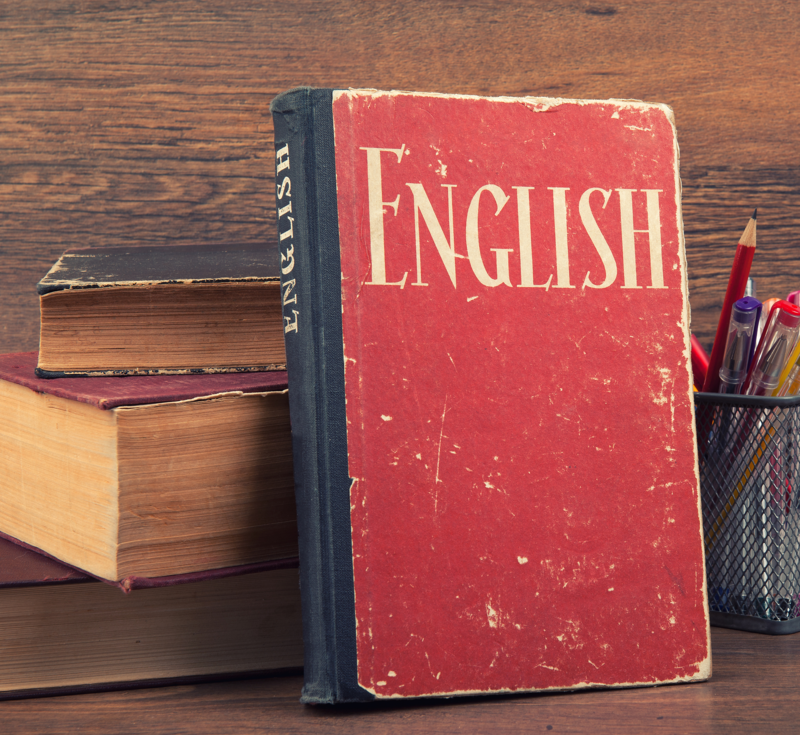 The word so has been in English pretty much as long as there has been English (derived from the Old English swæ). It is alternately an adverb (it’s so hot), a conjunction (eat your dinner so you can have dessert), an adjective (Jim is dead, isn’t that so?) and an introductory particle (So, I heard gun shots last night). For many, the ubiquity of so just to introduce a topic or idea in modern parlance (So, what are we doing?) 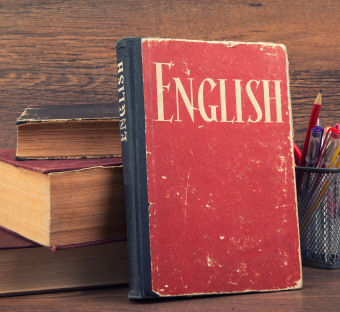 is troubling and often thought to be a recent addition to the language; however, English speakers have actually been using so to open a sentence since at least the Middle Ages. So let thy thoughts, low vassals to thy state’. So, so! – What, this is some freak, I warrant! So, that’s done – Well, I’ll fold it up presently. Nonetheless, the so haters do have a point that it is used much more ubiquitously in recent years. As for why, that’s up for debate, with the commonly touted theory putting the blame on Silicon Valley lingo. This was first noted by Michael Lewis in The New New Thing (1999)- “When a computer programmer answers a question, he often begins with the word ‘so’.” As to how this came about, it is thought that given the international composition of the typical Silicon Valley work site, where a large number did not speak English as their first language, it became the simple “catchall” word of transition. Over time and frequent usage, it eventually became like a tic and just part of the common speech pattern of those in that industry and then spreading beyond. A far better starter than um or well, both of which convey uncertainty, so connotes authority, as well as something being thought through. In the same vein, when it is used to answer a question rather than raise a point, inserting a so buys time – either to formulate a response or ignore the question and return to another topic. So, given its utility and specious appearance of authority, as well as sometimes helping to avoid awkward silence while you think, it is no wonder so has become so popular. Of course, as with all lingual conventions, it can be (and often is) overused. But as using so in this way has been with us since pretty much the beginning of the language and seemingly just keeps increasing in popularity, the so haters might just have to hunker down and endure while the present wave passes. What about the irritating use of actually? When and why did the use of take and bring get all mangled? I feel that “So” is often used today as a courtesy to denote and respect a person’s presumed involvement in the many stories that play roles in our lives these days, be it a political dialog (“So, when Trump opened his mouth last night…”), weather (“So the polar vortex is hitting us again tomorrow…”) or sports and entertainment “(So, my father met Yogi Berra in 1958…”). …except, “So” comes across as dismissive in emails. Generally when an email starts with “So” it means “No” to whatever idea you raised for consideration. Interesting article. What bothers me more than the use of the word “so,” is the out of control use of hyperbole today. I see this especially on the Internet, on blogs and on Pinterest – I very often see phrases like “I am completely obsessed with this cheesy potato recipe,” as if the writer truly thinks of nothing but cheesy potatoes from the time she wakes up until the time she goes to bed. I highly doubt it. I’ve been pondering the transitive use, and all usage forms of “So” this past year. Being a highly reflective individual it dawned on me recently (mid year 2015) that I had started to use “So”, too often in my conversations. To a person like me, this bothered me, and my analytical brain started to ponder why this was the case. Having these random thoughts, we wonder, “Does anybody else think of these things too, do they even care, would anyone bother to find out “why”? And wham, somehow I am led to this website simply by asking another question, “why does my urine go florescent yellow with vitamin B’s?”. While having confessed to myself and been found guilty, and becoming hackneyed, I naturally turned to observe others and lo and behold, I found this to be totally out of control with some people. Specifically, people at work were using all the forms listed in the article and it drove me nuts. Somehow, indirectly or otherwise, I had fallen prey to the same “So” syndrome, and I vowed to “stop the non-sense!”, at least for me. Like any habit-forming behavior, it became a conscientious effort, then gradually, I took control back. Other habit forming words, such as “Like”, really tortured our society, and some of us are perilously helpless. However, I must confess that I was raised in the heart of “valley speak”, the San Fernando Valley, California, when, and where it all began. And, Frank Zappa glorified our culture and spread it graciously across the rest of the U.S., and the world. Having germinated “We the people, …”, with our lingo, I was blown away how it took hold. Thank you, Frank Zappa, for reminding all of us, never, EVER to eat that Yellow Snow!! Great article, Great Website – you’ve been bookmarked for future reference. The rule for the use of the word “so” is to decide if the sentence would have the same meaning if the word “so” was not used in the sentence. 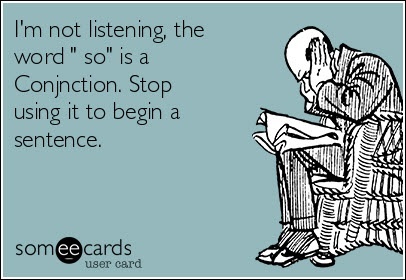 Hearing people start a sentence with “so” drives me nuts. Dealing with a clueless 40 year old boss who thinks speaking like a Kardashian makes her seem young. Her emails generally begin with “So” and she uses “so” to make whatever she is writing seem “less harsh.” She uses it so often in emails that I see “So” and I read “No” because she is usually saying “no” Just say No. I’m really comforted by the fact that others are annoyed by the continual and inappropriate use of ‘so’. It appears to be a substitute for the fake ‘stutter’ that was trendy last year,with the worst offenders being the er er er academics. Our speech has rapidly deteriorated during the last few years ,I find it disturbing,aggravating and so affected. Regain your individuality people,give ‘so’ ,’ literally ‘ and ‘awesome’ a break! Has the word invitation been replaced by’ invite’ forever? Most of the articles about this annoying phenomenon (and there are a lot of them), list a litany of inoffensive examples of sentences starting with “so” that are perfectly fine before getting to the trouble area — this article included. To me, the only offensive version, and I hear it a lot, is when Person A asks a specific question like, “How was the bowling tournament last night?” and Person B replies, “So, it was a real nail-biter, but we won.” That’s the version I’m hearing all the time that’s nails on a chalkboard to me. When starting a sentence with the word “so”, a listener will think the speaker has an inflated sense of self. It’s alienating, annoying, and utterly unnecessary. What raises the hackles even more is when a written sentence begins with “so” – just cut it out, people!! I agree with the last couple of comments. It not sounds improper, it sounds arrogant, condescending, and sooooooo annoying. I first experienced hearing a doctor witness in a trial a few years ago. His side lost, guess I wasn’t the only juror annoyed. Next was the Verizon rep who sold us our iPhones explaining to us why our insurance doesn’t cover the battery replacement to correct the slowing Dow of old iPhones. Both these guys came off as know it alls soooo maybe there is something to this all coming out Silicon Valley. As a 50+ year old Brit living in Gemany for 25+ years the increased (and incorrect) use of “so”, as stated by comments here, makes me want to physically throttle the speaker. Luckily for them, the only flawed English I hear comes from the TV or internet, where I’ll usually switch off/over (instead of attacking the monitor). My own take on the “so” phenomenon was that it was perhaps derived from German, where the dialect (at least Hesse and district) actively employs a long drawn out “soooooooooooo” before many fragmented sentences – although conversation flows without its use. Working in IT I doubt it has its roots there, none of the many tech. books I’ve read were diseased with “so”s incorrect use. I suspect it is a fad and the sooner it disappears from the face of the English speaking world, the better.